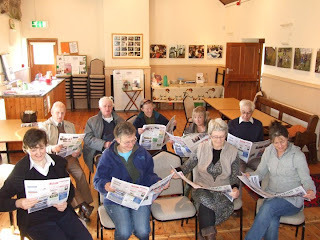 Our local history group reading the Weardale Gazette last week after a talk by our guest speaker Anita Atkinson, editor of the Weardale Gazette. Ivan Jones, George Bell Rutherford, Mary Bell, Terry Thompson. John Backhouse. Heather Ross, Sarah, Maxine Bulllivant, Sue Senior. Taken by Anita in Cowshill Village Hall.